But there’s a big difference between someone who lied or cheated and realized their mistake and a narcissist. There’s a big difference between someone who is confident and has a healthy self-esteem and a narcissist. There’s a big difference between someone who you think is selfish because they make their own needs a priority and a narcissist. There’s a big difference between having some narcissistic tendencies and Narcissistic Personality Disorder (NPD). One is annoying and usually very obvious, the other is manipulative and toxic to your soul. Being in a relationship with a narcissist means they are completely blind to their own shortcomings and they genuinely believe the lies they’ve told themselves so they can look themselves in the mirror each day. This means whatever is wrong in the relationship is your fault, not theirs. And eventually, there’s a part of you that begins to believe it. Being in a relationship with a narcissist means they have to hide and put up a grand facade, because deep down they know they’re not who they portray and don’t really like themselves, but you will never see those insecurities. This means you will never really know who he is and you will never be let in too far into his life or his heart. This leaves you always reaching for more and never quite grasping it. 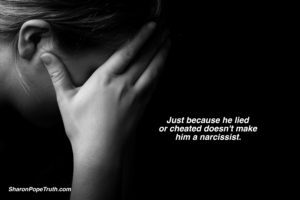 Being in a relationship with a narcissist means getting swept off your feet, only to suddenly have the rug pulled out from under you with the cold treatment, leaving you dazed and confused, hurt and rejected. And since he cannot feel or understand your pain, it will never be validated and you’ll start to question yourself about what’s real. All Heartache is Valid. Not All Heartache is a Result of Narcissism. I have worked with women who have been in narcissistic relationships, but didn’t know it. They typically are able to find some comfort in the knowledge that they’re not crazy after all, as they might have been led to believe. I have worked with women who said their ex was a narcissist, but he wasn’t. These women were genuinely hurting after a man they loved left them, lied to them or cheated on them and their pain was also valid and very real. They needed to heal the hurt that was caused so they didn’t carry that with them into future relationships, but that didn’t make their ex a narcissist. It might have just been a bad choice she made from a hurting place, and that can be healed. They have to unravel the lies they’ve been told about themselves and about the relationship. They have to see clearly the manipulation they experienced so that they don’t allow that treatment to continue in other or future relationships. They have to re-build their crushed self-esteem that was chipped away at over the course of months, years or even decades. They have to be the strong one that closes the door to the possible reconciliation a narcissist will dangle during their weakest moments. They have to see this as the dangerous disease that it is (with no cure) so they really move forward once and for all and save themselves in the process.